Thank you for taking the time to look at our FAQ page. We have answered some of the most commonly asked questions from our customers. The Information contained in our page contains information about your photo shoot. There is also information about our local area. Believe it or not, my most FAQ has nothing to do with Photos or what to wear. Most folks want to know fun things to do in Orange Beach. Hopefully, you can learn something that adds value to your vacation. If you have suggestions for items to be added to my page please email me and I will add it to the list. There are so many fun things to do in Orange Beach! There are nature-trails throughout Orange Beach and Gulf Shores. They are called the Back-Country trails. There are entrances throughout the cities. These trails are: bike, skater, and pet-friendly. Check them out for a fun and free outing! Afterwards, I highly suggest you visit Soul Bowls in Gulf Shores. They serve healthy fruit-based smoothies that are out of this world! The Coastal Arts Center of Orange Beach is a destination in itself! This place is amazing. I have photographed many families and weddings at this location. It is on the bay in Orange Beach, sitting under the oaks with hanging moss. The buildings themselves are picturesque. Inside you will find locals artists work on display and for sale. There is also a very impressive Clay Studio and the Hot Shop. Both offer classes to make pottery or stained glass. Stop in and see their demonstrations, they always welcome visitors! I have my favorite eating spots, hopefully, you will agree with my taste. The Southern Grind Coffee Shop, Another Broken Egg, and Brick and Spoon are my morning favorites. If you’re in Gulf Shores, Kitty’s Cafe is my breakfast and lunch restaurant of choice. Desotos Seafood Kitchen or Bahama Bobs. These are both in Gulf Shores and have that local flavor that keeps me coming back. I am not kidding, they know me by name especially at Desoto’s. Tell them Cynthia sent you! This can be tricky during spring break and summertime. The good places are crowded and you may have to wait, heck everyplace gets crowded at peak season. Here are the ones that I would wait an hour or so to eat. Big Fish, Cobalt, Cosmos, Fishers, Flippers and The Gulf all have great atmospheres and great eats! These are my favorite Orange Beach restaurants. If you are going for most popular, and don’t mind a long wait, you can visit the Hangout or LuLu’s. Both are extremely popular, so expect a wait. They are prepared for crowds so both have entertainment, shops, and games. Both of these are in Gulf Shores. Have you ever considered having your dinner catered while on vacation? You can stay in your swimsuit, at your condo and the dinner will be brought to you! I think this is a great idea for small and especially large families! My friends David and Tillie Pan are the proud owners of Orange Beach Concierge Services. On many occasions, my clients are also their clients. We have been at the same beach house or condos working side by side. From catering fancy weddings, family Lasagna night, to a big pot of gumbo on the beach over an open flame. I have seen these two at work creating marvelous dishes with style! No matter what you are looking for, you will find that Orange Beach has some unique shops. My favorite shopping for casual clothing and the home is Salt Coastal Outfitters on the beach road. This store carries comfy beach style clothing and accessories with a style all its own! Every time my sister comes to town she wants to go to Salt! Another great store for you ladies is Wildflowers Boutique on Canal Rd. It also carries very stylish clothes at an affordable price. If the whole family is shopping together, you can’t go wrong at the Wharf. They offer something for everyone. Just start at Shades and spread out from there! I suggest Sunday brunch at Ginny Lane’s. Trey and I like to spoil ourselves about one Sunday a month with Brunch and Jazz. I did not forget about you fellas! The fishing is nut’s around here. There are countless charter boats that go out daily, and I hear great things about so many. I have personally been on a few walk-on trips and can highly recommend the Reel Surprise. Randy and crew have been doing this for years and have a great system going. Parasailing, jet ski rental, and other water sports can be found at Pleasure Island Parasail. Chip and Kerry have all of these covered for your and the kids! Don’t be scared, I have participated in all of these activities with them and had a blast! Sail the Wildhearts for a fun adventure for the whole family. Trey and I also have taken this cruise at sunset for our anniversary. They serve fresh fruit and snacks and you bring your own drinks. Very fun and romantic! Keep your Mind and Body In Shape! I do love Yoga. You can find me there a couple of times a week in the off-season. There is an awesome studio in both cities. In Gulf Shores, I highly recommend Glow Yoga. They even offer Hot classes if you like to sweat. Orange Beach visitors can find a classy studio at the Wharf called Orange Beach Yoga. The most popular daytime activity for the kiddos is Waterville! They have it all, from waterslides, roller coasters to a surfing simulator! After a day at the waterpark, you can take them right on over to the Track or Adventure Island for more games and fun! After taking in plenty of seafood and beach time. You may want to take the kids on a great outing. I have 2 really fun suggestions. Check the Blue Angels website to see when the Angels are practicing. The Navy base is not too far away, and the practice show is like the real deal, with now crowds. You can also visit the Air Museum. Similar to this but in the other direction is the Battleship in Mobile for you boys. I bet you can convince mom to make the day trip if you promise to stop by Fairhope on the way! This quaint little town is just adorable and worth the 45-minute drive from Orange Beach to see the local shops and eats on tree-lined streets. You may have heard of the FloraBama. It is right there between, you guessed it, Florida and Alabama. It is worth going to say you have been. An experience for sure. Also, check the schedule at the Wharf’s Amphitheater. I have seen many great concerts under the stars at this local venue! A very entertaining evening out for my family is the Brandon Styles Show. The Live Bait in Orange Beach hosts this show a couple of times a week. If you can get tickets, do it! You and the whole family will enjoy this clean Vegas-style family show! I hope my loooonnng list of favorites is helpful. I will admit I am a bit spoiled living here in Orange Beach with so many things to do! If you have any suggestions of your own that I failed to mention, please let me know. 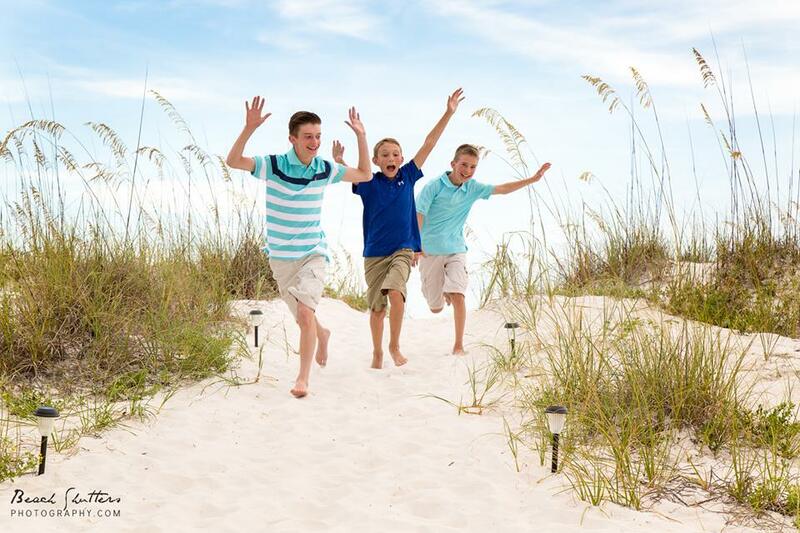 Have a great vacation and make sure to update your family photos with Beach Shutters photography again this year! Photos at the beach are casual for the most part. So unless we are photographing a wedding, I say dress comfortably. You will look more relaxed in clothes that feel and fit correctly. For more advice and examples on “what to wear”, see my post below. The first question everyone asks after booking a session is, “ What if it Rains ” on our photo day? The answer is the weather will more than likely clear up. We have a plan in case it does. What if it rains on my Photo day! What can I do to ensure that I get my photos during my vacation? Schedule photos at the beginning of your vacation. This allows a make-up day if we do happen to get rain on your picture day. During the prime summer months we are booked every evening at sunset, so if we have to reschedule, it may have to be a late afternoon session or a sunrise. If there is no good time for your family, then Beach Shutters will give you a full refund. Afternoon storms are common during the summer. As the days heat up, clouds build and do stir-up thunderstorms. These usually come around 4-5pm. I am very thankful for these afternoon showers. They cool the beach down, wash away footprints, and run the sunbathers inside. By photo time, the rain has usually past and we have a lovely setting for our session! Just because it is raining at the Gulf State Park, doesn’t mean it is raining at Alabama Point East. If there are sunset showers, there is a chance they are isolated. In this case, we can check the radar, pack up the family and go down the coast a few miles for clear weather. I have had this happen many times, and it works out just fine. One family that got rained out of their favorite spot was flexible enough to try a city beach in Gulf Shores. We relocated and got wonderful photos! The next year, they said they wanted to meet at the same Gulf Shores beach! Now they have a new favorite spot! Clouds are beautiful! If it is threatening rain, I like to go ahead and take photos. As long as there is no lightning, and no rain, the clouds make a magical background for beach photos. So don’t let the weather worry you too much. If it does happen to rain, we will reschedule if there is any way possible. If it does not work out, we can take indoor photos, or happily refund your deposit! Thanks for taking the time to read my “What if it Rains” FAQ! What is the big deal about Sunset for my Photoshoot. Sunset is the perfect lighting for your photoshoot. Sunrise is really good also, but really, 5:45 AM while on vacation does not appeal to everyone. We appreciate those who are willing to get up so early to get fully dressed and cleaned up for your sunrise photoshoot. Enough about the trials of getting dressed up for your photoshoot, Lets talk about light. The best light is consistently 30 minutes before the sun sets and 30 minutes after the sun comes up. Have you ever tried to take off your sun glasses at the beach and open your eyes fully, probably not. The sun is too bright for most people, with or with out sensitive eyes. Even if you manage to open your eyes, you will most definitely squint. For this reason alone, a sunset photoshoot is a must. Shadows are another issue that the magical sunset lighting eliminates. Any other time of day, the sun will cast unwanted shadows on your face. The soft light provided at sunset is virtually shadow free. This is where my pro level Camera and lens comes in to play. With low light, you are thinking we cannot get the shot, right? Well, with a few adjustments and presets, we not only get it, we love it! The camera gear is all dialed in for this time of day, and so sophisticated that we rarely need a flash. Next let’s discuss the south Alabama heat. It is hot here just about all year long. Luckily the sunset offers cooler temps for our photo sessions. This means less sweat to edit, and a more comfortable client. Comfortable clients, (dads in particular) make happy clients, haha! Lastly, the crowds of sunbathers have had their sun and fun for the day. They are all packed up and headed out to dinner by the time we get there for our photos. This means we can spread out and get our shots without being in someones way. This also means that I have less people to edit out of your background! There, you have it! There are so many reasons to schedule a sunset photoshoot with Beach Shutters. Not related to pictures, but just as important, even more so to the dads. Your all dressed and starving after those pictures. Lets go EAT!!! Flippers – If you need a break from the beach and would like to watch a sunset with sailboats. The food is good and reasonably priced to boot. The Gulf – One of my favorite placed to grab a cold drink and some fantastic food and watch the ships come in. Ships Harbor Grill – On the upscale side but still family. You can have a drink at the TIKI bar while waiting. Desotos Seafood kitchen – The best lunch in town, hands down. Affordable lunch with blue plate specials. Be sure to try the Flounder and the homemade MacNcheese. Bahama Bobs – My personal favorite. If you want to try the best burger on the Gulf of Mexico, you should definitely check them out. For those wanting seafood don’t worry they have that to. It is on the Beach and stays packed so try to go during non peak times of day. Blond Johns Surf Shop – Best kept secret in Gulf Shores. Go upstairs and order a Soul Bowl. It is healthy and good frozen snack. it consist of ground up Acai berries with fresh fruit, granola, and honey on top. The kids will think it is ice cream, but you know its healthy. The Hang Out – A fun nigh out for the whole family. It will be crowed but it is designed to keep everyone entertained. There are games, live entertainment, bubble maker, shops, photo ops and just great atmosphere. Pirates Cove – This is a local hangout both people and dogs (not kidding about the dogs). You can come by boat or car. Try out the cheeseburger in paradise and have a Bushwacker. Bring a swim suit for the kids. They can swim or jump of the dock while you are there. Sunset Grill – My favorite sunset eatery. Here you will find casual dining on the water and experience one of the best sunsets in the area. Be sure to try the Grouper Poboy. Flora Bama Yacht club – Get there by boat or by car. It is across from the FloraBama but totally different. The food and drinks are better and it has more of a family atmosphere. You can sit back and relax and enjoy a cold beverage and watch some live music with lunch or dinner. Don’t forget the bottom half. Our photographer may suggest a full-length pose. Make sure you coordinate portrait clothing from head to toe. Avoid excessive sun. Sun burns can effect your finished photos so please remember your sun screen and avoid sun glass marks and Tan lines. If you are going to wear foundation make sure it matches your skin – all of it. You want to make sure your face and neck are the same color. Bring a towel or wipes. It more than likely will hot and humid during your session in the summer. A sweaty brow can really mess up a perfect photo. Don’t mix light and dark colors in portraits. Save stronger colors and patterns for accessories. I personally like the look of Flowy Clothes. The sea breeze will most likely be blowing and flowing skirts and scarves give a soft beachy look. Can I get one more photo? I am occasionally asked if a customer can get more photos, and the answer is usually yes, but there is a fee for this service. Upgrade to the next larger package and increase the number of edited photos. Contact me and let me know what photo you were looking for specifically and I will work with you locate the specific photo or photos to ensure that they are of good quality and worth editing. If you choose to have them edited I you can pay via Paypal for the service. Keep in mind photos are deleted monthly, so if you think you want more please let me know as soon as possible. Looking for an Awesome Place to Stay? Hey guys! If you are looking for a great place to stay, I have a couple of connections. Send me an email or give me a call if you would like. I have photographed several rental properties, and I can put you in touch with the owner of the one that suits your needs!